I like to call the nights when I skip the menu plan and whip up something easy and quick “Flex Meals.” Really, it’s my way of almost not cooking- it’s as close as we can get to the convenience of take out. 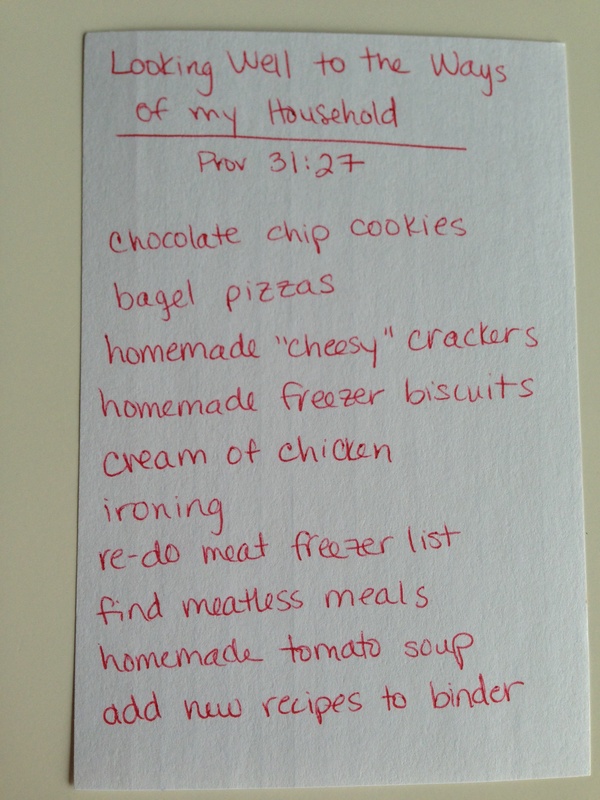 Because y’all know…we don’t eat out anymore as a family! If it weren’t for our date nights or girl’s night out, I’d never eat out. SG doesn’t. So, here’s how I’m able to throw together a flex meal, without doing much work. 1. 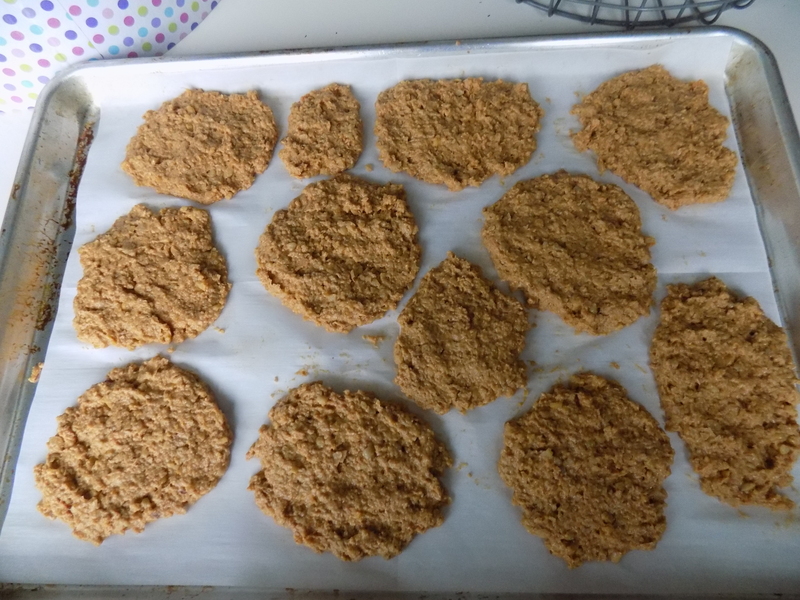 I keep a stocked freezer that includes cooked and cubed chicken portioned in one cup portions and pre-cooked and seasoned ground chuck, portioned in about 1/4 pound bags. I also keep Hormel cubed ham in the freezer. 2. 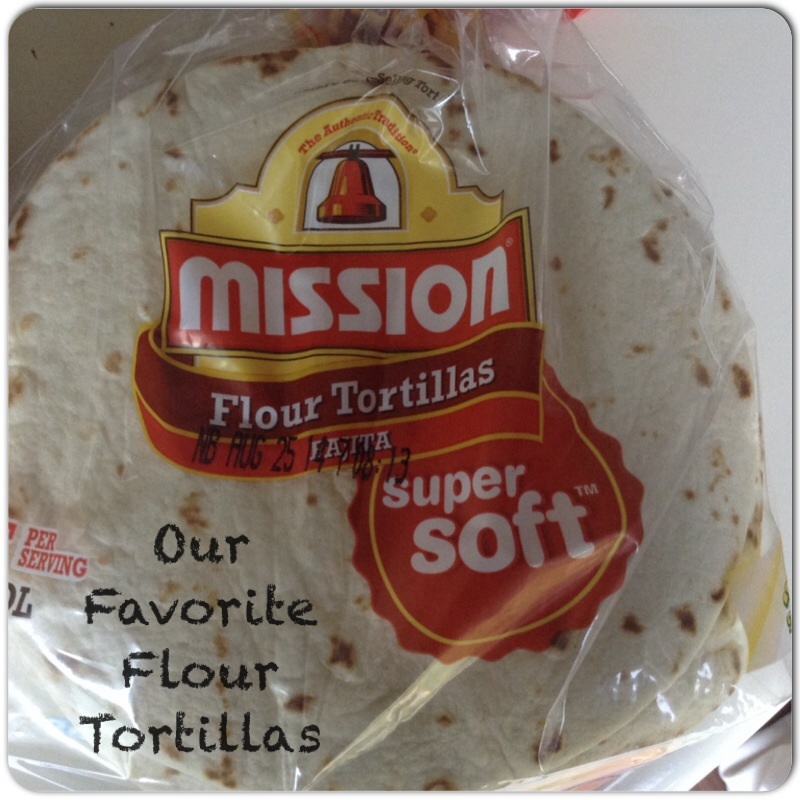 I always keep Mission flour fajita sized tortillas and Mission tortilla chips in the pantry. 3. I keep frozen Daiya cheddar style shreds and Daiya mozzarella shreds in my freezer. 4. I keep frozen broccoli florets in the freezer- the steam in the bag kind. 5. I keep Dole fruit in the little individual plastic containers stocked in the pantry. I can quickly and easily steam some broccoli in the bag and serve alongside any of the above. If I’m out of fresh fruit, then some drained Dole fruit will work. These also make great lunches! 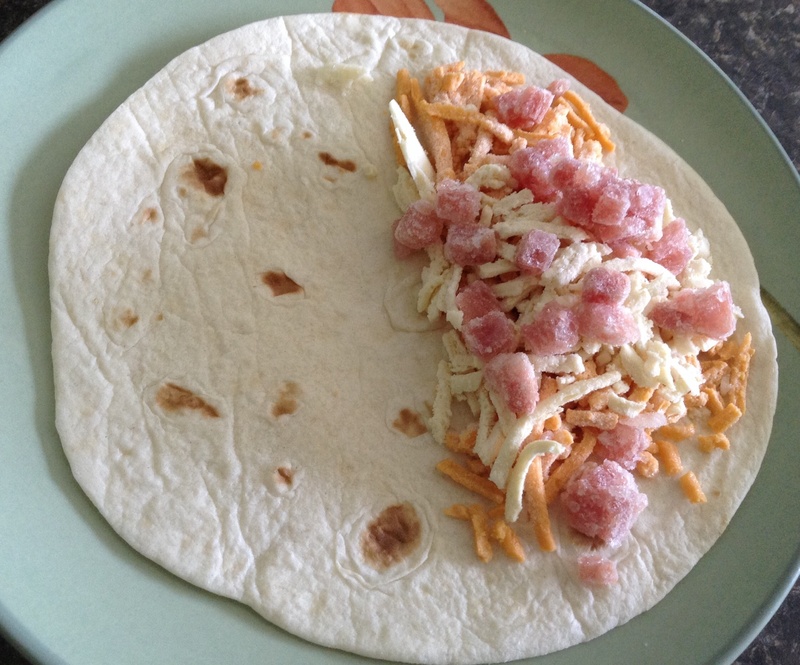 I put the ham and cheese in the tortilla frozen. The skillet defrosts and heats it all. 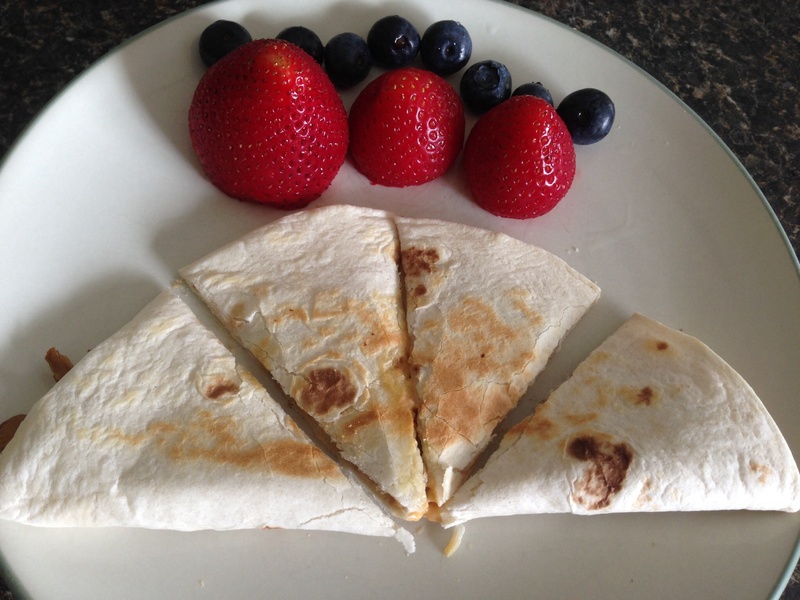 I used leftover Mojo Pork Tenderloin & Daiya cheddar shreds in this quesadilla. 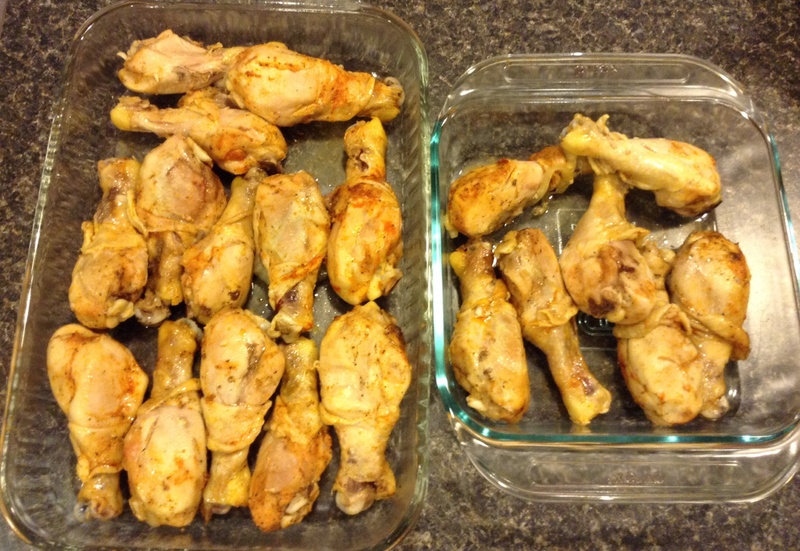 Here’s how I pre-cook and stock my freezer with our favorite chicken recipe. On the days I cook this chicken, the next day I always make a batch of this chicken and rice soup for the freezer. 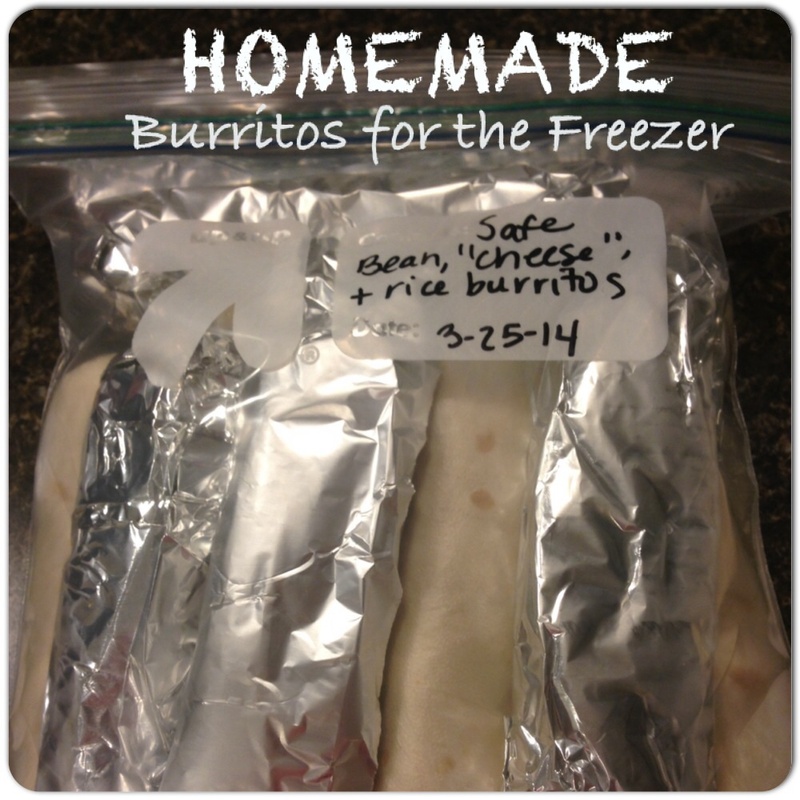 I freeze it in portions big enough for me and SG to eat for lunch. Homemade frozen soup is another easy flex meal. 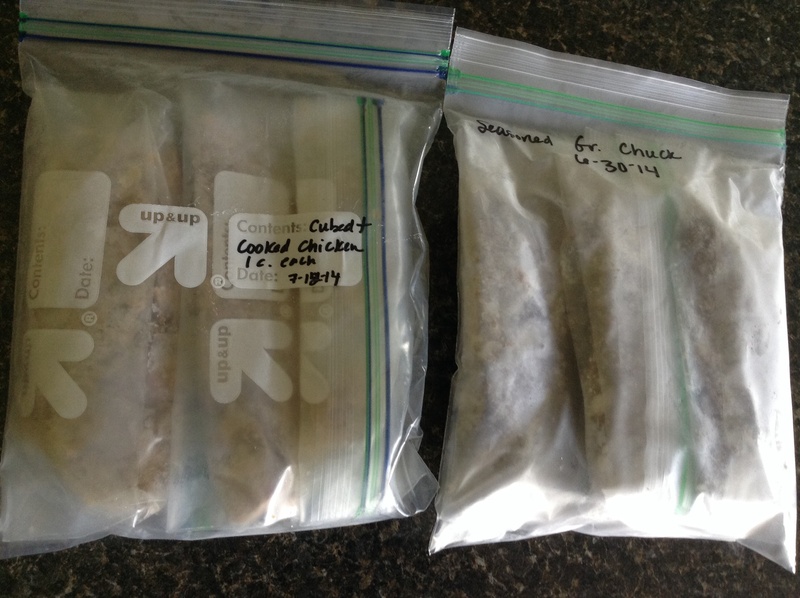 Here’s how I pre-cook and stock my freezer with ground chuck. I know the days I’m knee deep in cooking, cubing, portioning, and freezing chicken or beef, I will appreciate it in the days to come. And when I’m not feeling so hot or am just plain tired, I am so grateful for the meat I’ve cooked and frozen. Do you have any easy “Flex Meals” to share? Since we decided to sell our house in June, my menu planning has been non-existent. It’s funny that I wrote about getting my groove back, only to have it all go haywire again. Now that we are in the new house, we are not quite settled in. Actually, we don’t even have a pantry or space in our new small kitchen for food. 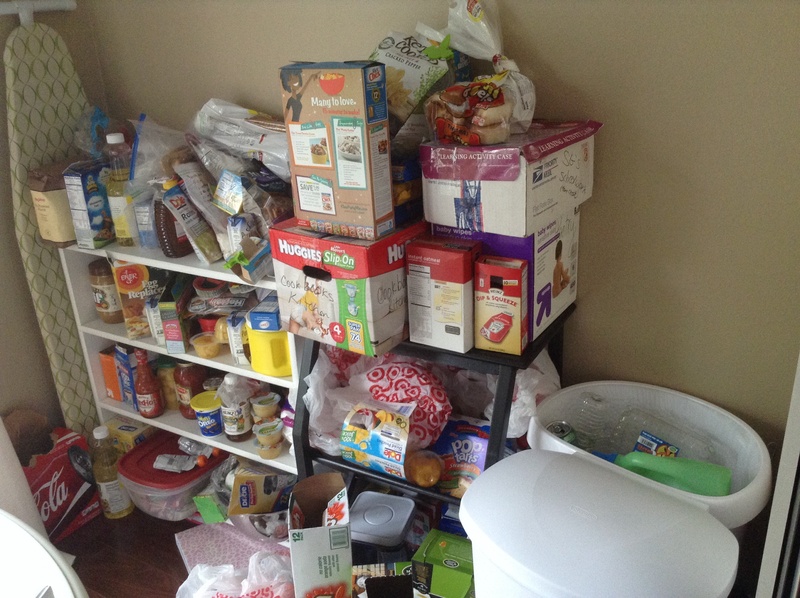 This is our current pantry… Gasp! It’s terrible. I.DO.NOT.LIKE.IT. Actually, it’s not even a pantry- yet! I love organization so this has been driving me crazy. The new pantry we ordered to extend our kitchen cabinets cannot ARRIVE FAST ENOUGH. (Floor to ceiling double pantry cabinets that will match the kitchen cabinets!) Until then, I remain feeling unsettled. Out of sorts. 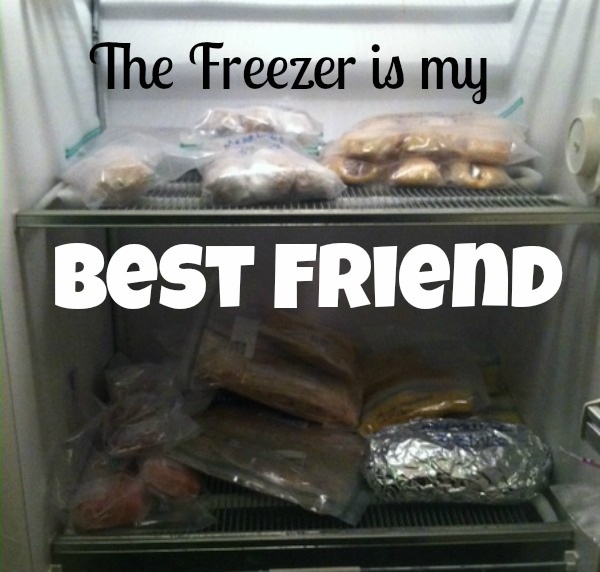 Thank goodness for my freezer. It really is my best friend. It has saved me almost everyday. 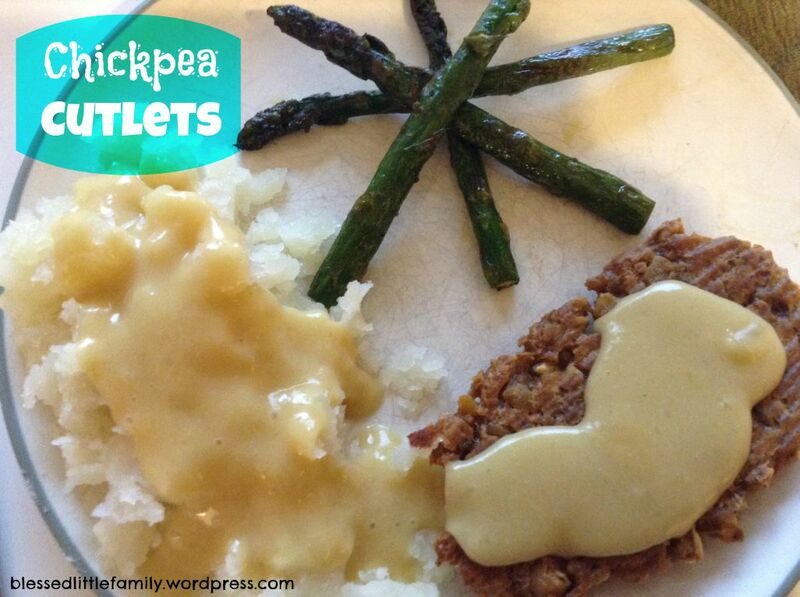 I had a brilliant little spurt a few weeks ago where I found great deals on ground chuck (4 pounds! ), flank steaks, and chicken. 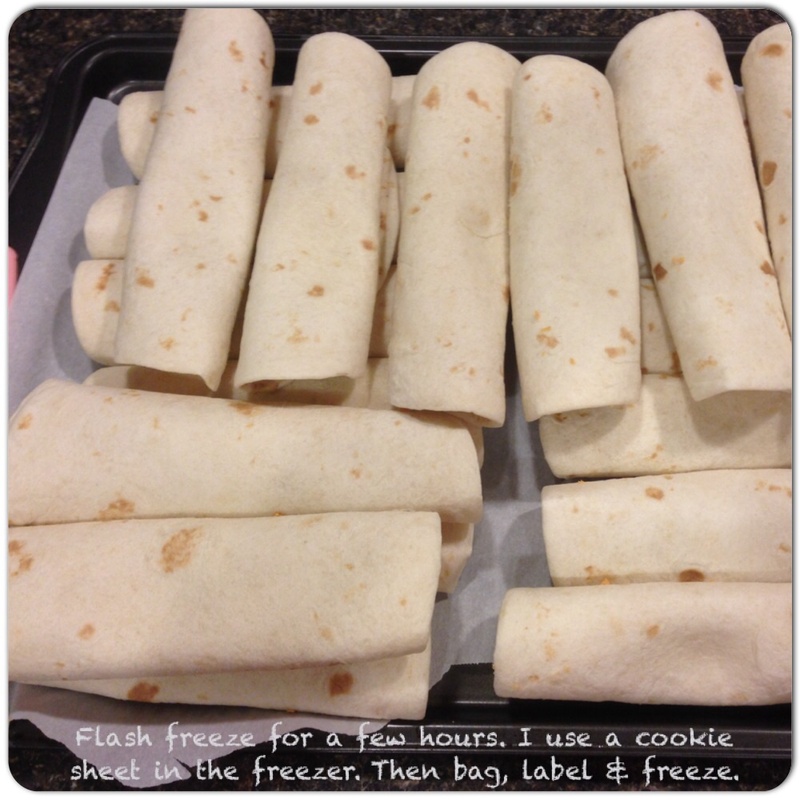 I had a mini-freezer cooking frenzy. 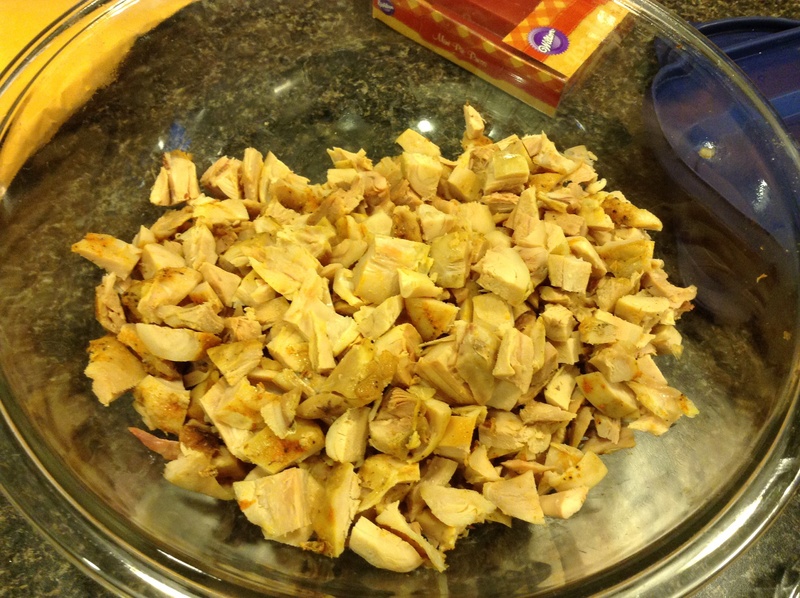 I marinated a few chicken breasts and froze them. We marinated a few flank steaks and froze them. We browned and seasoned all four pounds of ground chuck and portioned them into eleven ziplocs. Besides spaghetti, here’s what we’ve had for dinner lately, thrown together at the very last minute. 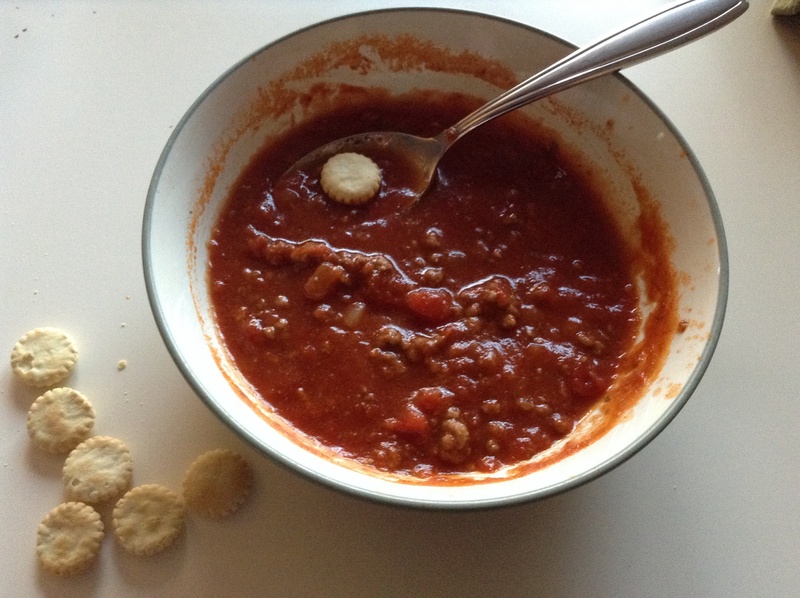 At around 5 pm last week, I googled “Easy Chili.” This was the first recipe I read, and just went with it. Click here to see the recipe. 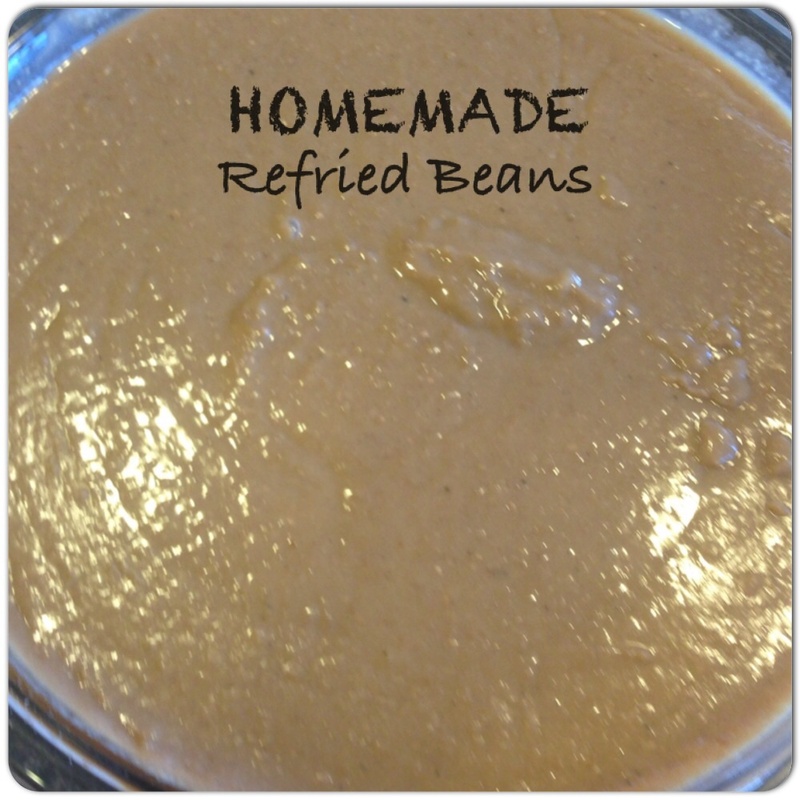 I did omit the beans and added more than a pinch of the chili powder and other seasonings. It was quite good. I wouldn’t say it was the best chili ever, but I’ll make it again. I also made Jiffy cornbread mini-loaves. I have a little mini meatloaf pan and like to use that for our cornbread. 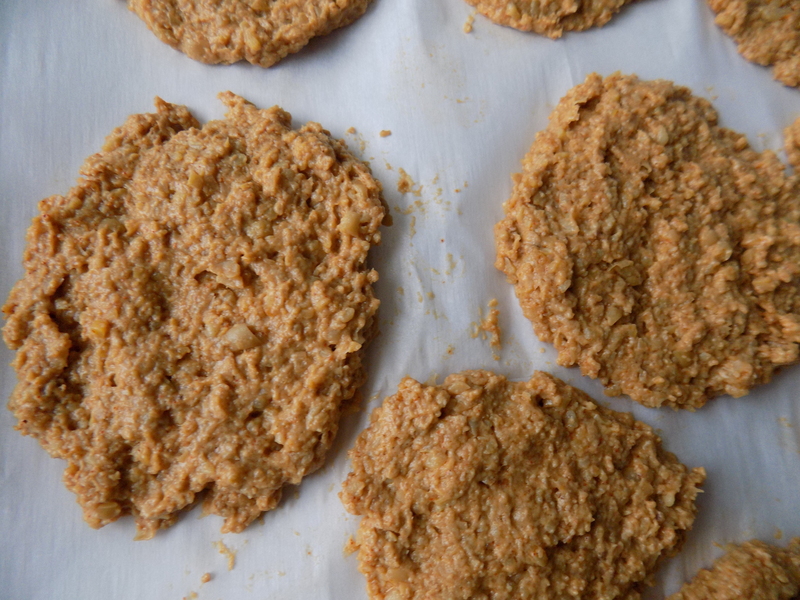 To make the cornbread dairy free and egg free, I used almond milk and Ener-G Egg Replacer. It turned out to be a great (last minute!) meal. And it fed us for a few days. Score! You will need to first make sofrito. Note: This is one of those family recipes that really don’t have measurements. The measurements are approximate and my mom and I have worked together to create these measurements as a guideline because I need measurements! 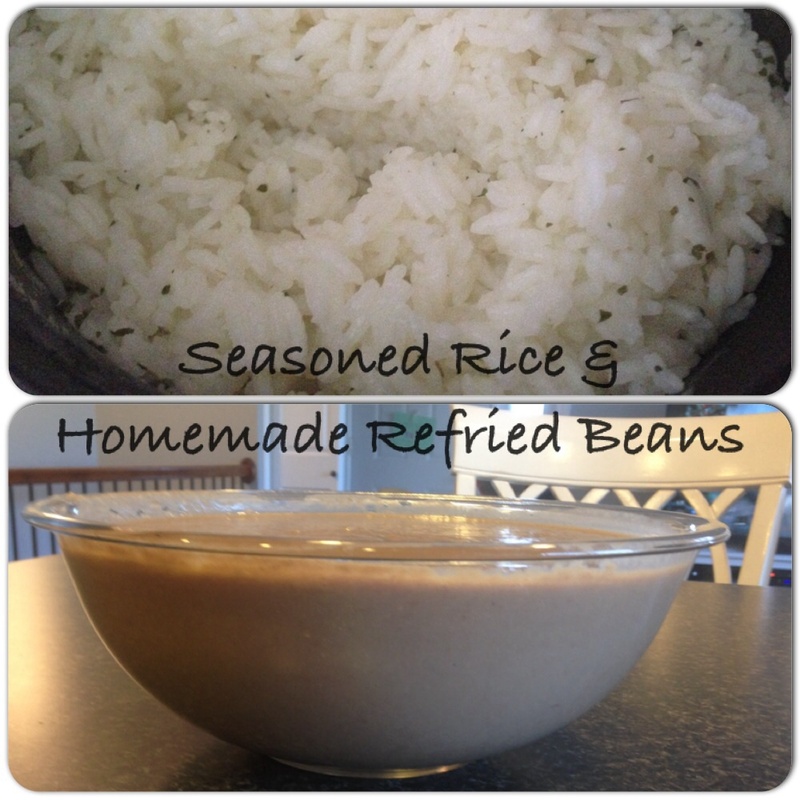 However, this is a taste and add more if needed recipe. 1. Dump frozen pre-cooked ground beef into a heated pan. Add all of the ingredients, bring to a boil and let simmer. Taste and adjust according to your preference. This is supposed to taste very seasoned- not bland. So be very generous when adding your seasonings! As it simmers, you may or may not need to add more water. You don’t want the picadillo to be too soupy or too dry. You want a little bit of liquid but not too much. 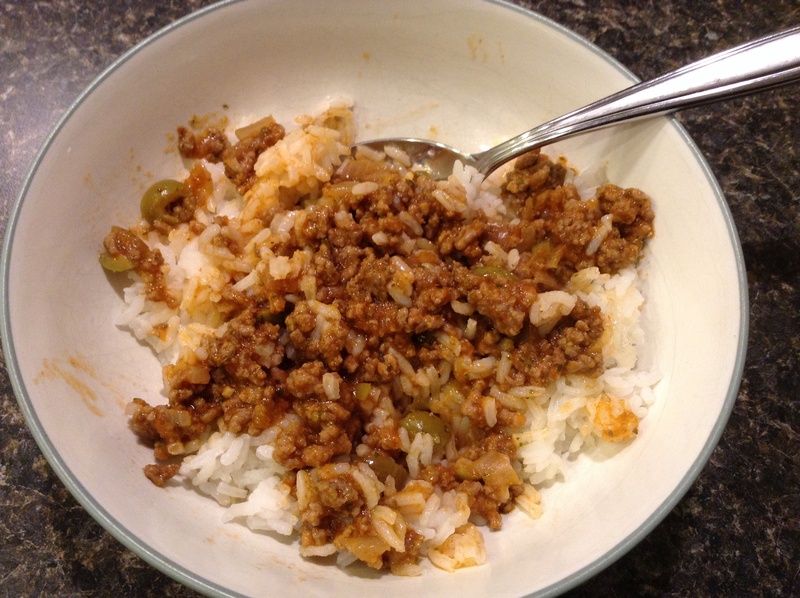 Here’s what my most recent picadillo looked like. 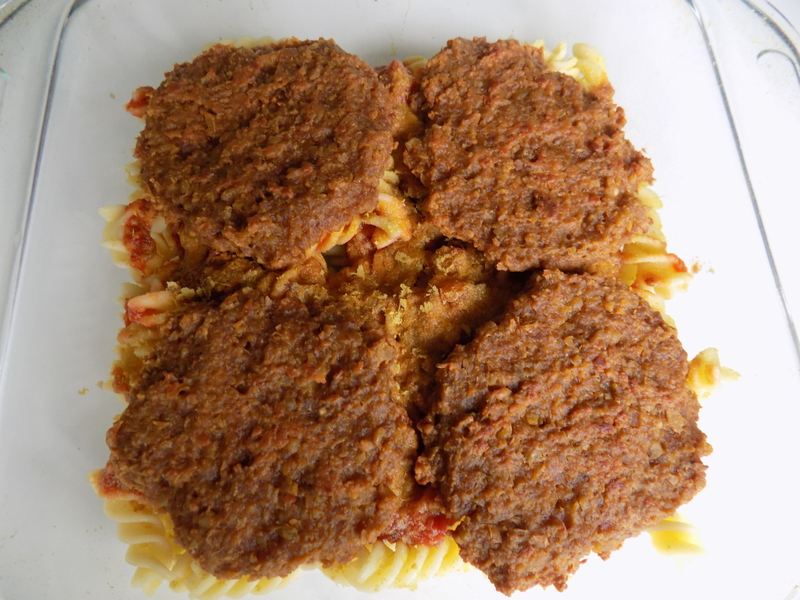 If you want to see my recipes for other ways to use ground beef and freeze it, click here.